I have a chance to review Oracle CRM On Demand Administration Essentials by Padmanabha Rao and Venkatesan Sundaram. First of all, What is Oracle CRM On Demand? It's Oracle Service, that you access over the Web. Oracle CRM on Demand help you to manage all your company’s sales, customer service, and marketing information. All pages in Oracle CRM On Demand share the same basic, interface framework. You can change the background color, hyperlink color, and so on by selecting a theme in your personal profile. OK! come back to a book that I want to review. This book will be useful for anyone who uses Oracle CRM On Demand. If You don't use Oracle CRM On Demand, you might start your FREE 30-day trial. 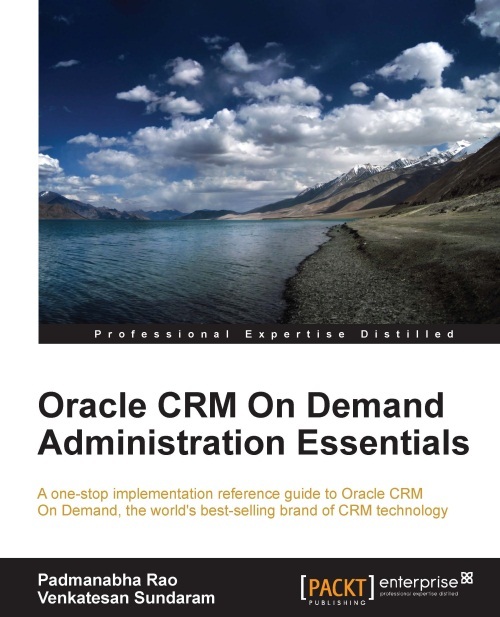 A book title is Oracle CRM On Demand Administration Essentials. You should understand before "Administration" in meaning, authors mean the business analyst combines with IT technologist. So, A book covers CRM On Demand Customization, Application Customization, User Access Controls, Business Process Automation and Management, Content Management, Web Services Integration, Reports and Analytics and etc. Who this book is for? This is a good question. It's will be useful to an architect, a product manager, a business analyst, an interface developer and the professional administrator. If You want to get this book, you should be able to access Oracle CRM On Demand! It will useful, because you will read and be able to practice from real world and see the picture. I believe this book will help you understand quickly, because you will see illustration on each chapter and authors do provide important informations helpful for readers. If you are using Oracle CRM On Demand, you want to read something over Oracle document. I mention this book. However, this book isn't for anyone. You should work and be able access Oracle CRM On Demand website. Note: You can download sample chapters in PDF format.